This Elations joint drink review will help you learn more about the supplement and make an educated consumer decision on whether this product is right for you. Elations joint drink is a supplement that comes in a liquid form and intended to maintain and nourish joint cartilage, bone and synovial liquid that make up our joints. The main ingredients in the elations joint drink are 1500mg of Glucosamine necessary to lubricate and moisturize joint cartilage for proper working condition and 1200mg of Chondroitin designed to optimize and make synovial fluid denser and make our joint work smoother than before. Both Glucosamine and Chondroitin occur naturally in our bodies but with age natural resources of these elements tend to get depleted and joints are not what they used to be anymore. To avoid having expensive knee cartilage injections some people turn to Elations joint health drink as alternative way of treatment. In addition, Elations joint health drink contains 300mg of Calcium and Boron intended to improve calcium absorption by our bodies. 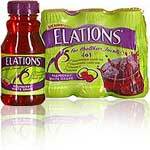 Elations joint drink comes in three delicious flavors that received a Culinary Seal of approval for their great taste like Cranberry Apple, Raspberry White Grape and Black Cherry. However, elations joint drink contains sucralose, an artificial sweetener, which some health professionals do not exactly consider to be healthful for you. Some experts agree that sucralose is an artificial chemical ingredient and can not be properly digested by our bodies. Additionally, elation joint drink contains artificial colors like Red#40 and Blue#1 that can cause allergic reactions in some people. If you decided to give this drink a try, please consider elations joint drink side effects if you are sensitive to sucralose or artificial colors. Elations joint drink could be an overall good choice for you on your road to joint health.